How To Hit A Big Dunk: Brittney Griner's Tweet Comes True For Baylor : The Two-Way The NCAA women's Sweet 16 is set as Baylor's Brittney Griner hits 33 points — and three dunks — while Delaware's Elena Delle Donne passes the 3,000 career points milestone. There's nothing like encouragement to help you succeed. Or maybe you can just create it for yourself. 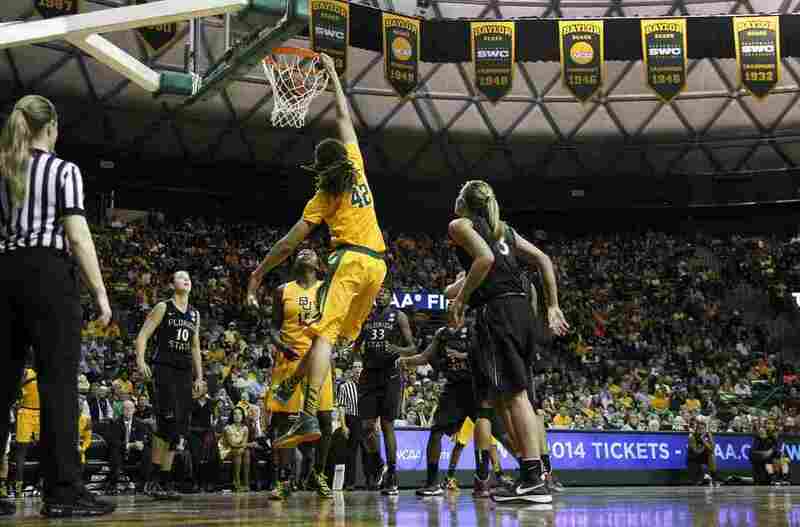 Baylor's Brittney Griner had both Tuesday night as her top-seeded team blew past Florida State 85-47. She had a double double: 33 points and 22 rebounds, as Encourager-In-Chief and former President George W. Bush looked on with former first lady Laura Bush in Waco, Texas. But that wasn't all. Griner has a career 18 dunks, three more than all other players combined in women's NCAA history, ESPN says. Baylor will face Louisville on Sunday. Another senior who had a big night was the University of Delaware's Elena Delle Donne, who racked up 33 points while Vice President Joe Biden and a packed home crowd cheered on the Blue Hens. Delaware, Biden's alma mater, upset third-seeded North Carolina 78-69. Philly.com reports that Delle Donne's career point total now stands at 3,006. Delaware is seeded sixth in the Sweet 16 and will face second-seeded Kentucky this weekend. In other action: Notre Dame put away Iowa 74-57. Next up for the Fighting Irish: Kansas. LSU took out Penn State 71-66 to face California. And Stanford crushed Michigan, 73-40, and will face Georgia on Saturday. Other teams advancing to the Sweet 16 are UConn and Maryland, Oklahoma and Tennessee, and Nebraska and Duke. You can check the women's brackets here.